I’ve been told many times by all sorts of folk that the colouring in my photos is really pleasing. Paradoxically, it’s really easy to underestimate how critical colouring actually is to “sell” an image to the audience. Certainly, when I first started out as a photographer I avoided strong-handed colouring, wanting to get it all correct in camera rather than excessive photoshopping. That’s all great and well before I started working in film, when I was young and inspired into photography by war photojournalism. However it simply doesn’t cut the cheese when trying to seduce people into watching the films I work on. Colouring is vital to communicating the tone of a film while making it stand out from it’s competitors. 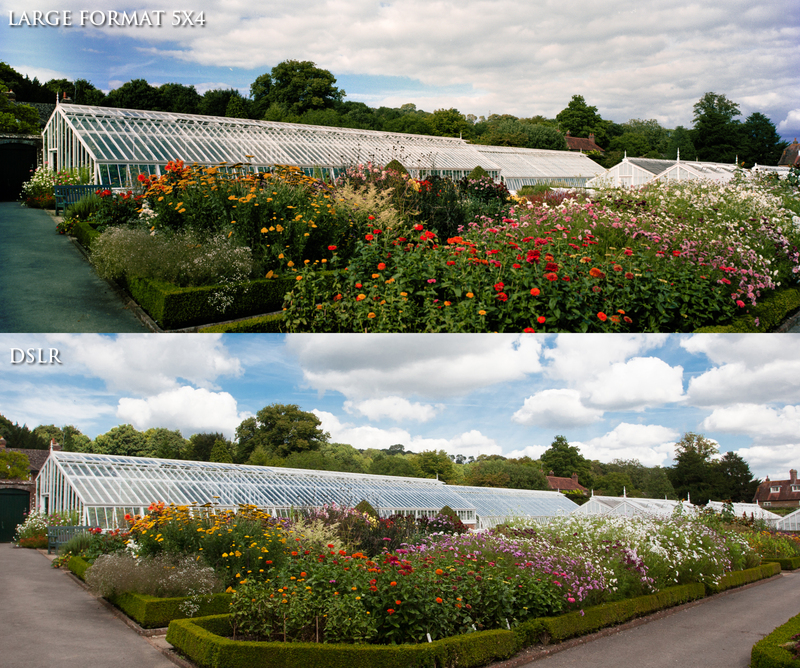 5×4 scan imported into Lightroom, viewing before / after colouring. In this example, I feel it’s pretty clear that the heavy blue tone overpowers what should be a fairly lovely (if Britishly overcast) summers day. The image also needs to be brightened up so that the scenes matches the viewers preconceived expectation. Pretty much everything I’ve photographed for the past 8 years has been shot in RAW, years before Lightroom even existed! 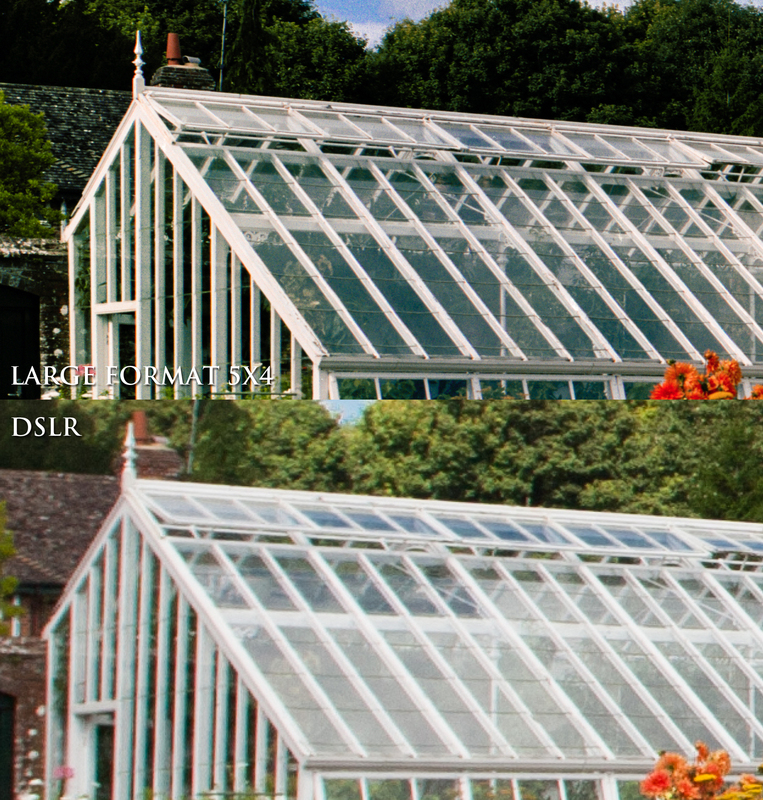 When you shoot in RAW you are the master of colour, want that blue to turn purple? No problem, just move that slider over! However when a scanned image has a particular colour it’s more of a hassle to switch it around, there just isn’t enough information for photoshop to number crunch. It’ll start to look messy and become very time intensive to remedy. This can be mitigated when scanning the negative, which is actually very similar to RAW editing, however when you have limited time (scanner hiring is expensive) and are unable to experiment, options can be limited. I certainly wish I could’ve sat down for a fair while to perfect the scans to make post-processing easier. 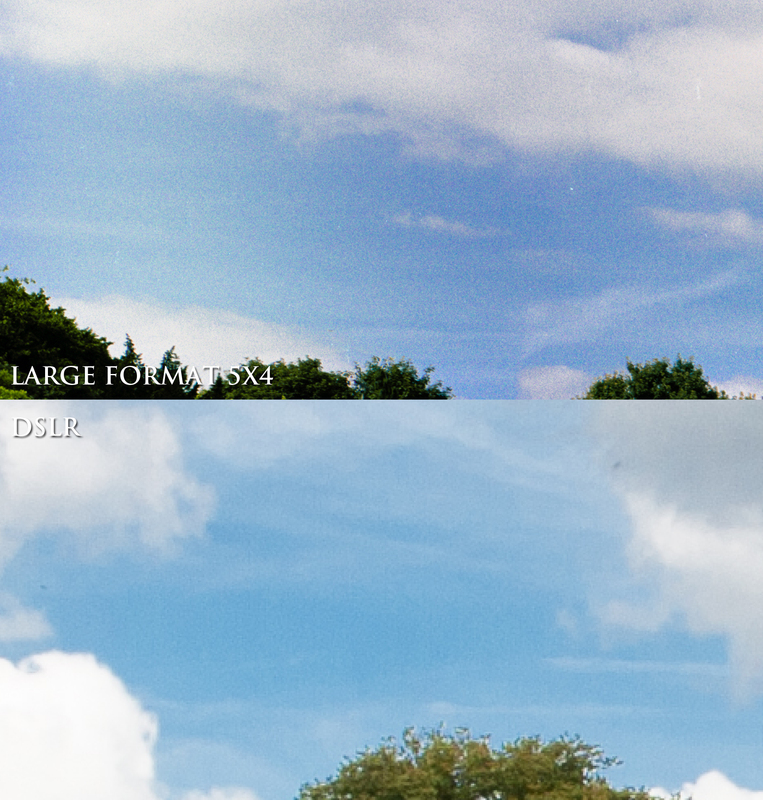 Looking at the comparison above of the Kodak Porta 5×4 film vs my DSLR is an interesting mental exercise. It’s one thing to manipulate an image into something you deem suitable, it’s relatively simple. However one of my personal pitfalls is comparing similar images that are different, but not objectively better or worse than each other, leaving it all down to subjective feelings of the viewer. Some people will prefer the character of the film version, others will prefer the clean, less contrasted look of the digital shot. Should I homogenise the film photo to look more like the digital shot, or should I work harder to make it’s own character more appealing? Lets look at a closer example. Techy Bit! Rule of thumb: all other things being equal, higher resolutions means more accurate colours. Even if an individual pixel is more likely to be grainy, or noisy/inaccurate, the larger number of pixels means better granularity between subtle shades. Shadows on complicated subjects such as flowers can hugely alter the colour of a flower if there aren’t enough pixels to discriminate between colours and deep shadows. Which of these two colour palettes are better? The saturated, vibrant tones of the film, or the more nuanced tones of the DSLR? Normally when colouring film stills, it’s somewhat easier, there’ll be a creative guideline to adhere to and promote, I’ll have an emotion I’m trying to invoke in the viewer. That helps me filter out different options that don’t support my goals. This photo falls outside of such commercial parameters however, there’s no dialogue to purvey. I’m merely trying to create something that will look appealing to as many people as possible. This is something that’s entirely subjective to each individual viewer. Do I try to stamp my authority on the picture by declaring one particular colouring to be the best, my personal favourite? Or do I try to appease to a larger audience who won’t look as closely as I do and will be judging the photo entirely on their subconscious, instantaneous reactions? How do I know what colours to choose in the end? Mostly through experience. Having photographed many subjects over the course of knocking around 9 years, it’s possible to pick up patterns in how people respond to different colour palettes. It’s less of a science and more of an educated guess, however I trust my own sense of what people like looking at. 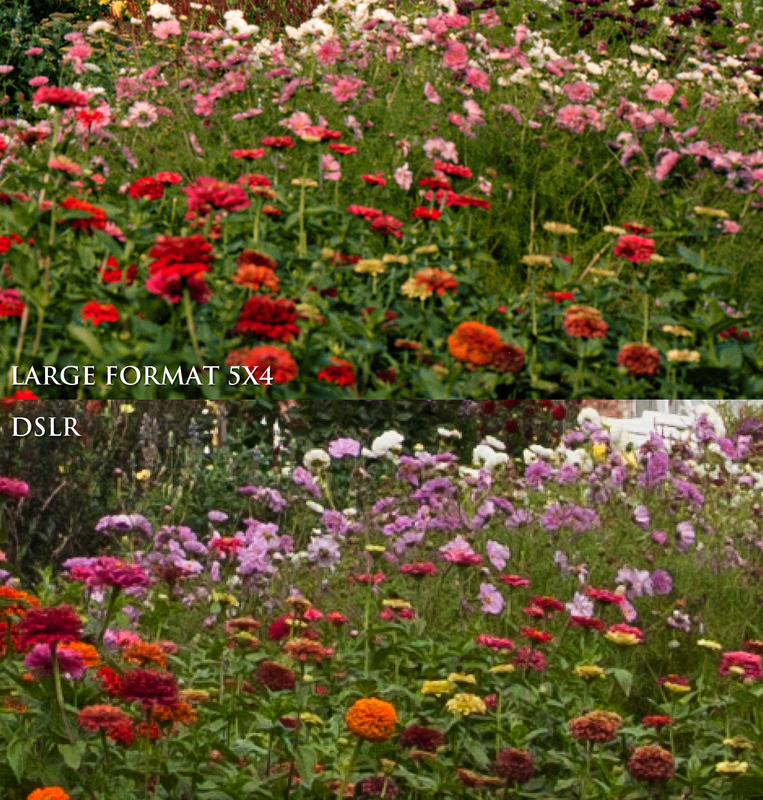 Colours aside, look at how much sharper that 5×4 image is! Jeez! So what do you prefer? The film colours, or the digital? I’d love to hear your thoughts an opinions! This entry was posted on December 5, 2013 by marchankins. It was filed under Photography and was tagged with Colour, Colouring, Kodak, Large Format Photography, Lightroom, Photography, Photoshop, west dean.